After last week’s post laying out the basics of what a WordPress theme is and does, we’re going to move to picking the right theme for your site. Trying to choose a WordPress theme can be a bewildering experience. With thousands of free and premium themes available, finding the best one for your site can be a larger undertaking than you might expect. Here we look at an important early question in choosing a theme: Should I go with a free or a premium theme? Free WordPress themes are great because they’re free! And free is awesome. The other upside to using free themes is that the process of choosing a free theme integrates beautifully with the core WordPress software. Because free themes (like plugins) are distributed through WordPress.org itself, you can quickly browse, test, and install any number of themes directly from your WordPress admin. It’s part of the beauty of WordPress, without a doubt. Many Free WordPress Themes Lack Support. Most WordPress theme authors release their free themes with the best intentions, but many just can’t spend hours on support for a theme that makes them no money. This is probably the biggest downside to free themes. All themes have bugs that need to be worked out, all users of themes in general are going to have questions, and there are always going to be issues regarding each theme that need to be addressed. Even though most WordPress theme authors release their free theme with the best of intentions, many just cannot justify spending hours on support for a theme that makes them no money. This is absolutely understandable, but just understanding the reality of the situation doesn’t eliminate the frustration from needing support and not getting any when the time comes for it. So how can you tell of the theme you like has this issue? One way is by checking the theme’s support page in the WordPress Theme Directory. If there are a ton of unsolved support questions, then that is likely a clear indication that you may not get the help you will likely need if you use the theme. Free Themes Are Not Always Updated. If a theme hasn’t been updated in over 2 years, this generally means it’s been abandoned by its author. Updates are an integral part of everything WordPress. There are WordPress Core updates, theme updates, and even plugin updates. These small improvements clear up bugs, boost security, and often include upgrades for a better end product. As with the issue mentioned above, the economics of “free” means many theme authors often fall behind in the update department. Since a theme needs to be regularly updated to help keep up with the other updates that come along (WP Core and plugin updates), a theme that doesn’t have this is really going to hurt you in the long run. If you find a free theme you’re fond of, be sure to check the last time it was updated (you can find this on the theme page in the WordPress Theme Directory). If a theme hasn’t been updated in over 2 years, this generally means it’s been abandoned by its author and shouldn’t be used. Depending on what you’re looking for in a theme, this can either be a good thing or a bad thing. Many free WordPress themes lack a large number of desirable features and functions. For example, there may not be options that allow you to easily upload a logo, or change the font on the blog. Obviously, there’s more to the list than that, so it is important to have an idea in mind of what you want and need your WordPress theme to do for you. Most often, a simple glance through the features list in the theme’s description will tell you if you the theme will match your list of needs. You can always test them quickly in your WordPress admin. Free themes tend to be a labor of love taken on by a WordPress developer, while premium themes are products put out into the marketplace for a financial return. This issue underlies the other problems above. Essentially, free themes tend to be a labor of love taken on by a WordPress developer, while premium themes are products put out into the marketplace for a financial return. This means that when the free theme developer runs out of funds or free time, the theme stops there. Maybe the developer has great coding skills but can’t afford a graphic designer to give the theme a beautiful design—or maybe the theme’s beautiful but indifferently coded and hard to use. Or maybe the developer got bored around the footer, and the footer layout reflects that. Premium themes suffer in other ways from their dependence on the marketplace (we’ll get to that), but successful theme vendors can be relied on to take their themes all the way—development, design, user interface, security, the works—because they expect a financial return for doing so. The cons of free themes tend to outweigh the pros. Sadly, the cons of free themes tend to outweigh the pros, and they’ve received a pretty bad rap because of it. One article about how a free themes might have malicious code in them can turn a lot of people off of using them. However, free themes aren’t bad in and of themselves. WordPress.org has a standard of coding that all themes must hold to before being made available for download in the Theme Directory; and there are some free WordPress themes that are regularly updated, and have relatively good support and features. If you’re an average blogger, or someone on a tight budget, free themes can be a great option for you. Free themes might also be great for an initial buildout of your blog prior to its grwoing in traffic and income. What it really comes down to is doing some research to find what the theme has to offer, but we’ll dive in to that a little later. For now, let’s take a closer look at premium themes. Though premium themes may seem like the obvious choice, there are still points that should be considered before buying the first premium theme that catches your eye. “Premium” does not automatically mean that the theme is better than any free theme available. Let’s take a look at the general pros and cons of premium themes. Regular Updates and Great Support. Unlike free themes, premium themes have a distinct advantage in the support and customer service department. Since theme authors are being paid for their product, they can afford to spend the time doing updates, and giving support and customer service to those who purchase their products. More Features and Design Options. 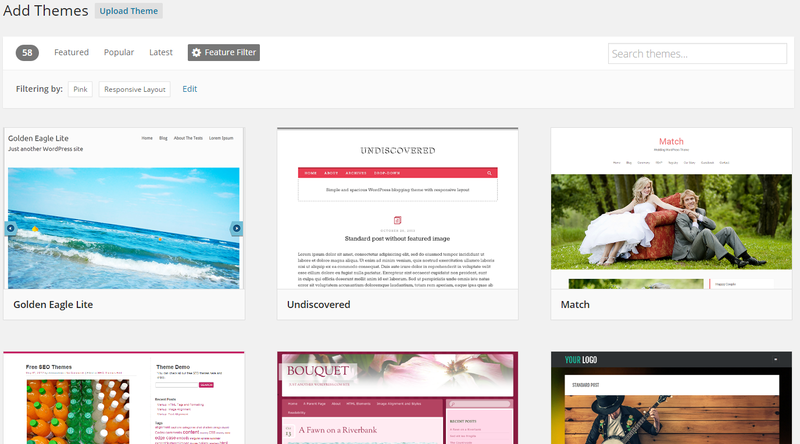 Premium themes also tend to have more features than free themes. These can be things like being able to support specific plugins such as WooCommerce so that you can build an online store, or perhaps a widgetized homepage option that allows the user to easily build a somewhat custom looking homepage. As far as design, many premium themes have offer multiple layouts, custom post types, and multiple color schemes to let users quickly and easily make visual changes. Really the list of what a premium theme may offer is endless. Many Premium WordPress Themes Look Alike. Yes, it’s true that there is more than one way to style a given theme. However, the layouts and styles of many themes tend to have that cookie-cutter effect—they can start to look the same after awhile. Magazine themes, for example, can be eerily similar. Though the back-end features and the functions in the theme may vary, the visual result can be less unique than you may like. Generally speaking, the price for a single WordPress theme starts at about $50, which isn’t all that bad. However, some themes can cost over $100, and some theme shops carry a pricing tier of well over $700! If you’re a small business or a one-man show, this can be way outside of your budget. What Sells Isn’t Always What’s Right. Theme buyers often buy based on outsized promises, meaning technical problems with the themes themselves. Theme buyers often buy based on outsized promises that you can use a theme to do everything you want, with no technical training. Unfortunately, making “it does everything!! !” a primary selling point often means technical problems for the web developer who has to make the theme work properly. So, for example, drag-and-drop functionality is a selling point to many theme buyers. The downside here is that drag-and-drop themes are also much more complexly coded than other themes. This can result in slower loading page load speeds, adversely affecting your SEO efforts; and it also makes them more difficult for a developer to work with and troubleshoot. As another example, themes are commonly stuffed with every possible feature imaginable, because some subset of people won’t buy it unless it’s, for example, “easy to add a calendar.” This makes some sense but it also leads to slow, bulky themes and a problem called theme creep that makes it hard to switch off a given theme without losing all your data. Quality Is Still A Toss Up. Unfortunately, there is not single standard for quality with regards to WordPress themes. Although you would expect the best out of a theme that you paid money for, it’s by no means guaranteed. In particular, there’s no guarantee that your web developer won’t go crazy when he or she looks under the hood and sees how the theme is actually put together. The answer comes down to a single word: research. Do you plan to use your theme for a simple blog, or for a small business? Are you going to need to build an online store? Do you need a lot of customization options? Only you know exactly what you want out of a WordPress theme; therefore, there is no single perfect theme. Instead of looking for WordPress themes based solely on their appearance, make a list of everything you want and need out of your theme and then start looking at ones that fit the bill. If you can’t find exactly what you’re looking for, your best option may just be to hire a WordPress theme developer to advise you, to customize a theme you already have, or to build you a theme from scratch. We’re not done with themes yet! Stay tuned for next week. When you sign up to get notified of our newest article every Thursday, you'll also get an awesome free ebook about content marketing. Sign up now for that double win! uf, this is my nightmare in WordPress 🙂 I m not so long in WordPress and still can not find right theme solution for my websites what I m developing. Its so hard to determine which developer do great job. I have trouble with this and I dont look on price, but for quality and performance what is relatively problem in most of themes. Some looks really cool, but are bloated with tons of functions which double load time, what is unacceptable for me. So on the end, after long and hard searching I still did not find some kind of ”premium” themes for my needs. I like purity and simplicity and always found only heavy bloated themes.